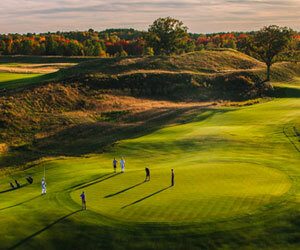 LANSING, MI -- Back pain afflicts nearly all golfers at some point in their life. Poor posture, heavy golf bags, long trips in cars or planes, and the extreme torque of the golf swing all take their toll. The Lumbar Extender from B & K Sports is designed to help golfers  and athletes of all types  counteract these effects by providing a consistent, controlled stretch for the low and mid back. The design of the Lumbar Extender is simple: A hard yet flexible plastic arch supports your back as you lie on it. The arch fits into a 2.5-lb., solid plastic base, and can be adjusted to three heights, depending on your level of comfort and flexibility. No pulling or movement  just gravity stretching both your back and abs. B & K Sports President Barry Herbst reports, People marvel at the simplicity of the Lumbar Extender and how easy it is to use. Constructed of a specialized, durable polymer, the Lumbar Extender is lightweight and portable, and it fits easily into golf bags and carry on suitcases. The companys web pages and press releases cite professional golfers from Michelle McGann and Chris Smith to chiropractors and physical therapists who praise the Lumbar Extender. But TravelGolf.com decided to get a second opinion. We took the device around to a couple of local physicians. They agreed that it looked useful, and that used properly, it shouldnt do any damage to a healthy back (always a plus). The elderly father of one of the doctors even tried it out for us, and liked it. However, both physicians agreed that one could likely get the same effect from a rolled up towel. And considering that the suggested retail price of the Lumbar Extender is $129 (which includes a pillow, pad, video, and mat), the towel would be a lot more affordable. Ah...the rising cost of health care! Nevertheless, the Lumbar Extender is indeed a useful aid in the fight to stay limber. The first time I lay down on it, my back snapped, crackled, and popped like a bowl of Rice Krispies. These days, there are far fewer disconcerting sounds coming from my spine, and my abs feel tighter, too, thanks to better posture. Hopefully my swing will benefit as well.